Like any sports fan, race enthusiasts want the latest updates about their favorite pastime, and they want them now. Auto Racing Live gives you that information, but little else. NASCAR in Your Pocket: Auto Racing Live gathers racing headlines from ESPN, Yahoo, and Fox Sports. You’re unable to add additional feeds. The NASCAR-focused app from iApp Ventures is not much more than a news reader that pulls racing news from three sources: ESPN, FOX, and Yahoo. You can toggle between each of these feeds, but you can’t add additional sources. After launching the app, you can read the headlines, or open the full article in the built-in browser. You can also choose to bookmark the link, which can later be opened in Safari. Auto Racing Live’s App Store page claims a “true offline browsing experience,” but that wasn’t my experience with the app at all. Yes, when you have no cellular or Wi-Fi connection available, you can read the news summaries you’ve downloaded during your most recent connection. But if you try to tap Read More, Auto Racing Live prompts you to connect to the Internet before more content can be loaded. That’s not exactly offline browsing. Don’t expect live race updates, either. Auto Racing Live is a headline service—nothing more—and not a very customizable one at that. 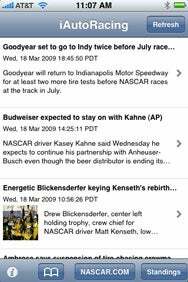 NASCAR fans who want the latest news but don’t want to click around the Web via Mobile Safari may appreciate the collection of headlines this app provides, even at its $5 asking price. Personally, this app had me waving the caution flag. Auto Racing Live is compatible with any iPhone or second-generation iPod touch running the iPhone 2.x software update.